Greg and I are very conflicted on whether this first week has flown by or gone at a snails pace. We flew into Japan last Tuesday evening which feels like at least a month ago. Yet, we wake up early every morning to start exploring and all of a sudden my stomach is growling and I realize we haven’t eaten since breakfast over 8 hours before. Either way, we’re having such an amazing time. I think we are officially over our jetlag now. We still go to bed relatively early, but the last two mornings we actually had to use an alarm clock rather than waking at 6am for no reason at all. – Finding places for the first time has become one of the most frustrating things for me. We can get to train stations easily, but put us on the streets of Tokyo and we are the most lost people in the world. There doesn’t seem to be any sort of system for street placement. And don’t get me started on street names and addresses. – 711 has become our new favorite for cheap delicious food….weird huh?! – Starbucks free wifi is the best. Without it we would still be wandering around most parts of the city lost. – We had two warm days, but other than that it’s been freezing here! I did not pack well for this weather. Our favorite place so far has been Sumida Park, which is where this week’s picture was taken. 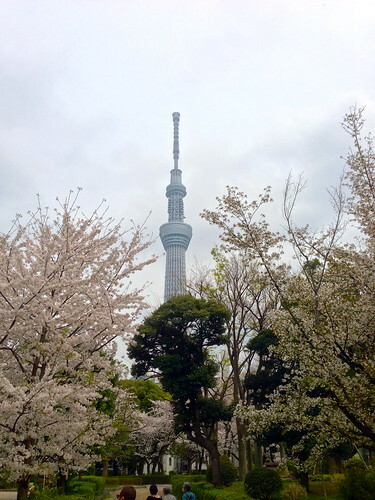 The park was covered in cherry blossoms and had a great view of Sky Tree. Next, we’re off to Osaka and Kyoto! from what I’ve been told, Tokyo’s street name/number system is one of the most counter-intuitive in the world. everyone I know who has been there has shared your frustration. Still it is a wonderful place to visit. Like your pictures a lot! Getting lost was actually enjoyable sometimes because it led us to places we never would have thought to see.